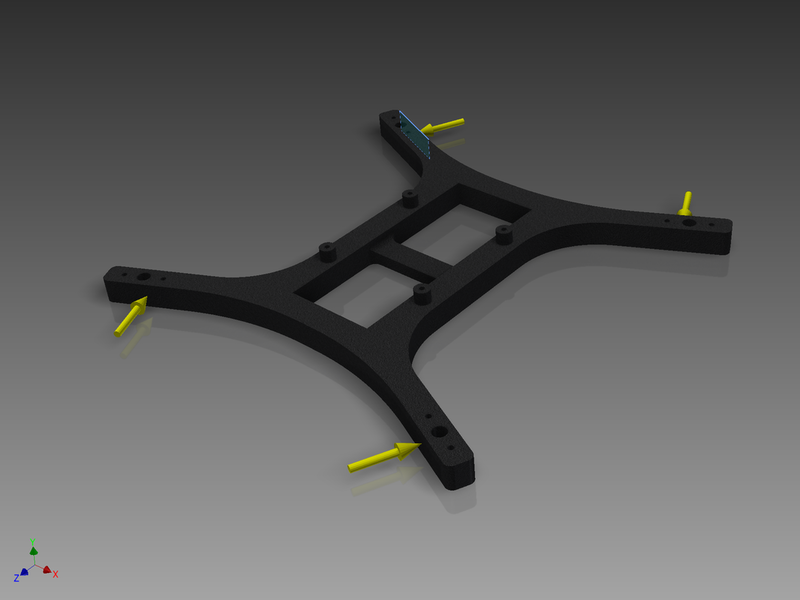 The design of this quadcopter originates from the conventional H-quad format. A while ago, I built and flew a micro h-quadcopter made out of basswood and components similar to what I am using on this 3D printed quadcopter. After having flown and crashed the basswood model many times I began to notice areas that needed improvement. One of the biggest issues I had while flying the basswood quadcopter was that the arms would continuously break at the joints whenever the quadcopter crashed. I order to help mitigate this problem, I decided to bend the arms outwards at a 25 degree angle. The main idea behind this was to protect the arms in the event of a tumbling crash. With the arms angled outwards slightly, the forces felt in a tumbling crash would be more axial rather than perpendicular to the arms. In addition to this, I also chose to strengthen the arm joints by adding more material in the vital corners. 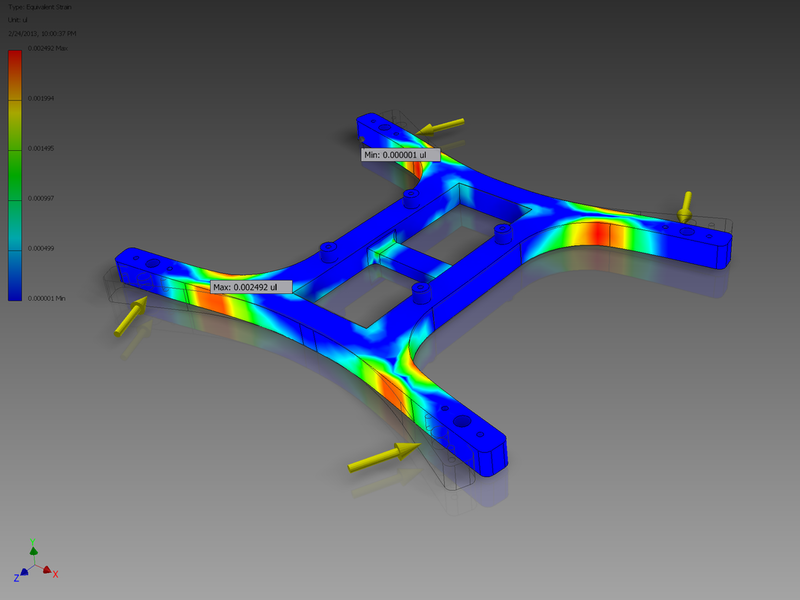 In order to verify the design, I ran a worst case scenario stress test in Autodesk Inventor to see how the frame would react if 10 lbs of force were applied perpendicularly to each arm. As the picture above shows, the principle stress concentration occurs at the joints, however, this is also what the frame was designed to handle. Additionally, when the design is 3D printed, it will be constructed using a honeycomb infill. This method of printing will offer a significant amount of rigidity and will resist bending moments very well. I also included a few other things in the design in order to make the assembly a little easier. For mounting the KK2 board, I made 4 small posts with 2mm holes so that any standard 50mm board could be screwed into place. I also added a small cross beam in the middle of the frame for attaching velcro or any sort of battery retainer.